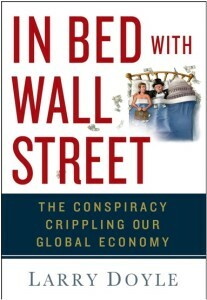 The wizards in Washington and on Wall Street will prop the market and talk up the economy because they can. 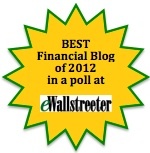 Where can you go to get independent, unbiased insights and analysis of the economy, markets, Wall Street, Washington, and the global financial landscape? 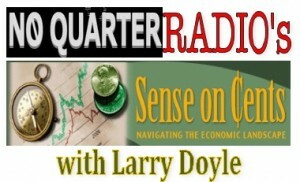 You have come to the right place as this Sunday (8-9pm ET), No Quarter Radio’s Sense on Cents with Larry Doyle Welcomes Back Daryl Montgomery. If you are looking for a profitable alternative to Wall Street hype, the New York Investing meetup is the place to go. Our goal is to provide timely, unbiased, reliable, cutting-edge investment analysis and education that our members can use for money-making investing decisions. We do this by monitoring, organizing and interpreting financial news to create an accurate picture of broad trends in the macroeconomic and investing environment. This analysis is then used to find which areas of the market offer the best investing opportunities and most dangerous pitfalls. We further refine our results for more immediate action by using technical analysis and to a lesser extent, fundamental analysis. We don’t just present investing analysis, but also attempt to explain the thinking behind it, so our members can learn over time to do it themselves. We deliver this information with presentations by the organizer and guest lecturers. Lecturers are selected for the timeliness and quality of their material, their ability to communicate it and their lack of a hidden agenda. They must produce informational talks and are not allowed to use their lectures to make a sales pitch. In similar fashion, Sense on Cents is strictly ‘selling’ truth, transparency, and integrity as we look to help you navigate the economic landscape. Listen LIVE at the BlogTalkRadio website. Dial in with questions at 347-677-0792 or join our always energized chatroom. As a reminder, all NQR shows are taped, archived, and available as podcasts on iTunes. Thank you to Larry Johnson and No Quarter Radio for providing such a fabulous outlet. Raise your hand if you do not trust Wall Street and Washington. Raise your other hand if you do not trust the financial media. Why do I viscerally envision a lot of hands being raised all over America? Because given developments of the last few years, Americans — at an ever increasing rate — are less trusting of Wall Street, Washington, and the media. What is one to do? Where can one go to embrace honest dialogue focused on real transparency and integrity? You have come to the right place as tonight from 8-9pm ET No Quarter Radio’s Sense on Cents with Larry Doyle Welcomes Daryl Montgomery.